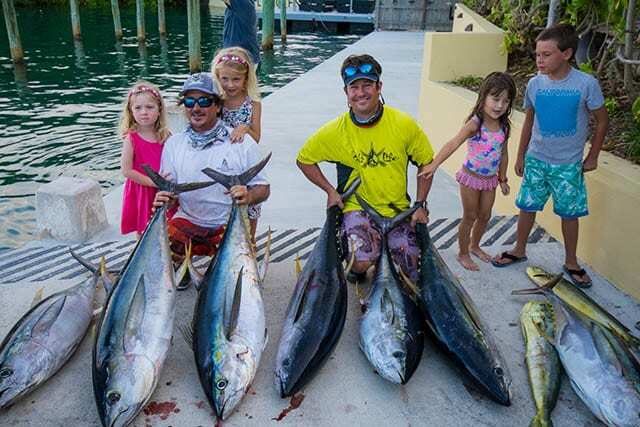 Amelia and Peyton Long with their dad, Aron Long, the captain of Team Long’s Marine, and heaviest tuna winner Wayne Russell, with friends Emma Albury and Lucas Waugh. PHOTO CREDIT: Chris Maingot. It was a very successful tournament with 23 boats fishing. Team Da Reel Gals fishing on Hook it Up was run by a crew of all female anglers—way to go! They were received by cheers when they weighed their fish. All the big tuna were caught off of Freeport and all of the heaviest mahi were caught off of Abaco. There were weigh-in stations in Freeport, two in Abaco, Spanish Wells, Nassau and Clarence Town, Long Island. To our knowledge we are the only tournament that has multiple weigh-in sites around the islands. 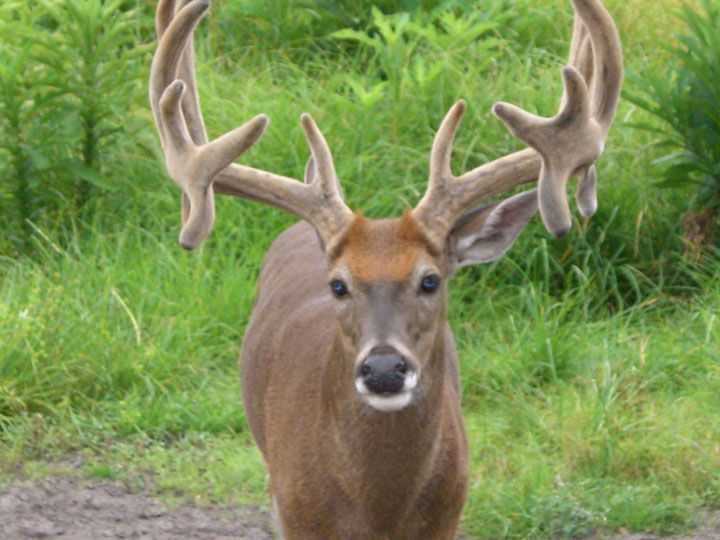 It leads to a lot of intrigue as to who caught what. Heaviest Tuna: Wayne Russell, 69.0-pounds, team “Long’s Marine”. Longs Marine, dominated the tuna category, winning first, second and third prize tuna. Heaviest Mahi: Steve Claussen, 38.2-pounds, Day Dream. Heaviest Wahoo: Chris Lloyd 18.0-pounds, Bite Me. Heaviest Grouper/Snapper: Loran Pyfrom, 75-pounds, Live Life. Top Junior Angler: Luke Myers, 18-pound mahi, Catch u Later. 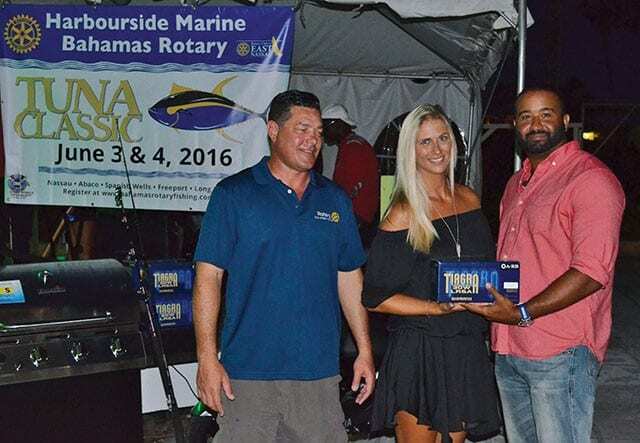 All funds raised benefit the Bahamas Rotary Club. 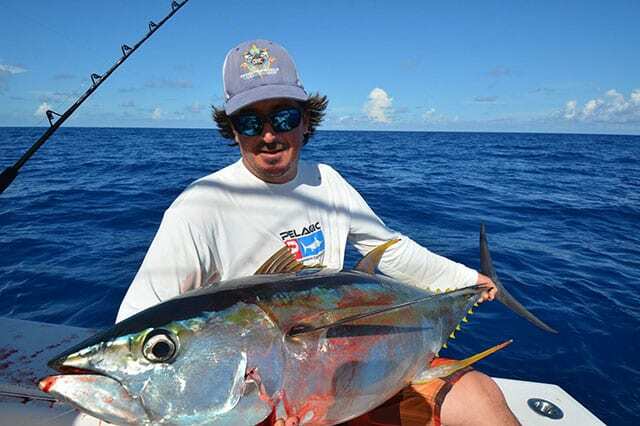 Aron Long, captain of Team Longs Marine, with one of the team’s tuna. PHOTO CREDIT: Chris Maingot. 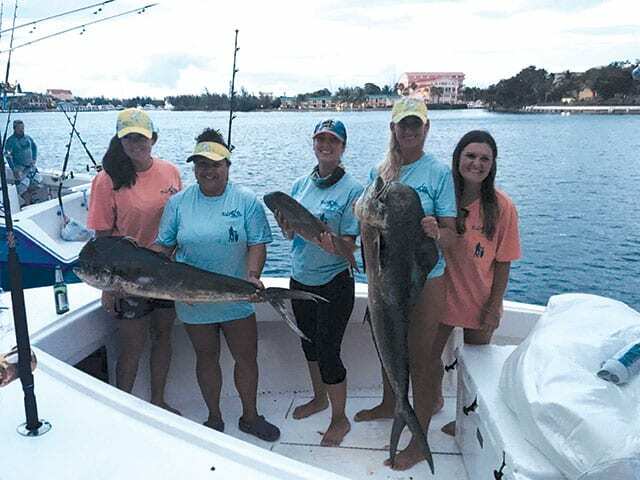 The only full female team, Da Reel Gals, comprised of Lauren Butler, Brittney Baldwin, Marie Hynes, captain and winning angler Siobhan Antoni Bates, and Kelly Hondros. PHOTO CREDIT: Kim Klonaris. Craig Pinder with Top Female Angler, Siobhan Antoni Bates, and Andrew Bell from Harbourside Marine. PHOTO CREDIT: Kim Klonaris.